Greedy Meow is Gourmet whom eat and walk around the world and cities; tell you what food taste good, where have fun and interest, sharing the eat experience with you. I picked the table behind the seashore. The waitress with her beautiful smile to served me. The ambiance had already made me relax. I ordered half dozen of raw clams as my appetizer that putting on the lightly clumsy ices with the house chardonnay. The servers put the Tabasco hot sauce on my table before the dish come. They never pushed me until I finished. I can say at that moment was enjoyed, not only feed me food. I ordered the main course was called Asian Mussels Pot. I can’t believe when the dish comes out because it was so big and that only $ 19.99. 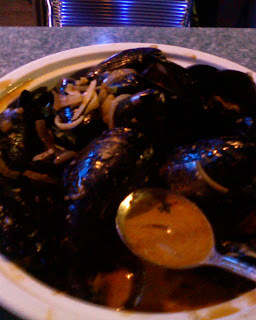 The taste as Thai style; mild creamy spicy, cilantro, garlic and cooked with fresh mussels. Although, if you didn’t feel trouble to take off the little mussel’s hairs and the mussels size are little. But taste is very good to compare the frozen one. Seriously, when you have no idea for how to cook the mussels after you grabbed a bag from supermarket. Please, just step in there! I enjoyed my B-Day dinner and the warm seashore wind! FungsBiz - All Copyright Reserved. Greedy Meow eats around in the cities!